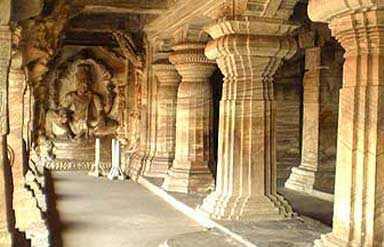 Previously known as Vatapi, Badami is the centre of ancient Chalukyan glory. It is situated at a distance of about 500 km from Bangalore in the Bagalkot district of Karnataka. Founded by Pulakesi I, this magnificent town is located amidst the rocky hills. Renowned for its amazing rock-cut cave temples in Chalukyan style, the place also boasts of its wonderful attractions like majestic forts, cave temples, serene lakes and colourful festivals. 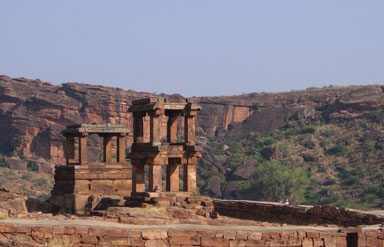 Badami was the capital of the early Chalukyas rulers. They ruled Karnataka and Andhra Pradesh between 6th to 8th century. Originally, it was founded by Pulakesi I in 540 A. D. Later on his son, Kirthivarman (567-598 AD) and his brother Mangalesha I (598-610 AD) built amazing cave temples during their reign. The Chalukya kings were great patrons of literature, arts and philosophy that can be seen in the forms of architectural wonders. 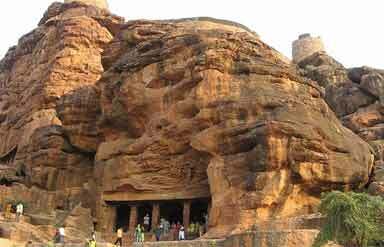 It is the group of four cave temples that are beautifully carved out of red sandstone hills situated opposite to Badami Fort. Out of these four cave temples, three temples are based on Brahmanical theology and one on Jain. These temples are the finest example of sculptures as well as stone carvings that depict of several mythological themes. Through all these temples are equally amazing yet the Cave Temple is very popular. Built of red sandstone, the temple has a hall with many pillars and a square shrine hollowed in the back wall. It houses the statues of Lord Shiva along with his consort Parvati. Another popular attraction of the place is the eighteen-armed Nataraja displaying 81 dance poses. The third temple, dedicated to Lord Vishnu is another amazing attraction of the place. This fort is situated on the hill top that is famous for its two Shivalayas. Due to its majestic location, the fort offers a bird-eye view of Badami. One can also see here the ruins of a watch over, treasury and large granaries. The beautiful temples of the fort also depict the legends of Krishna through its various murals, frescoes and sculptures. This famous museum boasts of its unique collections of ancient specimens that offer the glimpses of historical era. Dedicated to art and architectural work of the bygone era, are the four galleries inside the museum. The prime attractions of the museum include beautifully carved Makara Torana, the Lajja Gauri images of a fertility cult and a panel depicting scenes from Bhagwad Gita as well as animal dummies. You can visit this museum between 9 A.M. To 5 P. M.
Due to its historical associations, Badami is gifted with several fairs and festivals that are celebrated with great enthusiasm and unlimited joy. Held at Banashankari in the month of January/February is the Annual Temple Festival, which is very famous here. Another popular festivals include the Mallikarjuna Temple Festival and the Virupaksha Temple Car Festival celebrated in the month of March/April. The cuisine of the city has the three staples-rice, ragi and jowar. Meat and fish dishes are also available. 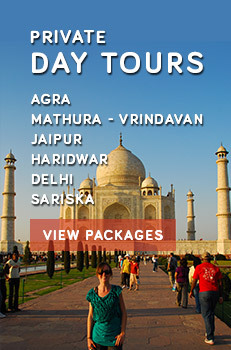 Tourists can get regular fast food, Indian and Chinese delicacies. Handicrafts and rugs are the popular shopping articles in Badami. Badami has limited options of accommodation. It ranges from mid-range to budge properties. By Air Belgaum is the nearest airport. By Rail Railway service is available from Gadag from where you can get a link to the bigger cities like Hubli and Hospet. By Road Badami is well-linked by road to all the major destinations in the south. Karnataka State Transport Corporation also operate buses from Badami to Bangalore, Aihole, Bagalkot, Bijapur, Belgaum, Pattadakal and Hubli.